These tender, flavorful baked meatballs have been a family and reader favorite for many years. Serve them with spaghetti and your favorite sauce, as an appetizer, in a meatball sandwich–or all by themselves. Perfect meal prep recipe that freezes well, too! Perhaps you are like me in this way: I have recipes everywhere…a shelfful of cookbooks, a box with recipe cards, and various pages torn from magazines, newspapers…and so many slips of scrap paper with my own hand-written notes that I scratch out as I create in the kitchen. Amidst all the recipes, I return often to the gems given to me by my friend, Jen. Like me, Jen likes to experiment with new recipes and acquired many of her favorites from her grandmother. A single recipe yields two dozen golfball-size meatballs. The recipe can easily be doubled and the baked meatballs freeze well. I made the batch pictured below with a friend. Meal prep is inherently rewarding–and so much more fun when chatting the whole time! Click here for my favorite gluten-free option to panko. And for a sauce option using vine-ripened plum tomatoes, I love this recipe for Balsamic Pesto Marinara Sauce. Shortcut Blender Tomato Sauce (above) pairs beautifully with these meatballs and is perfect when vine-ripened tomatoes are in season. 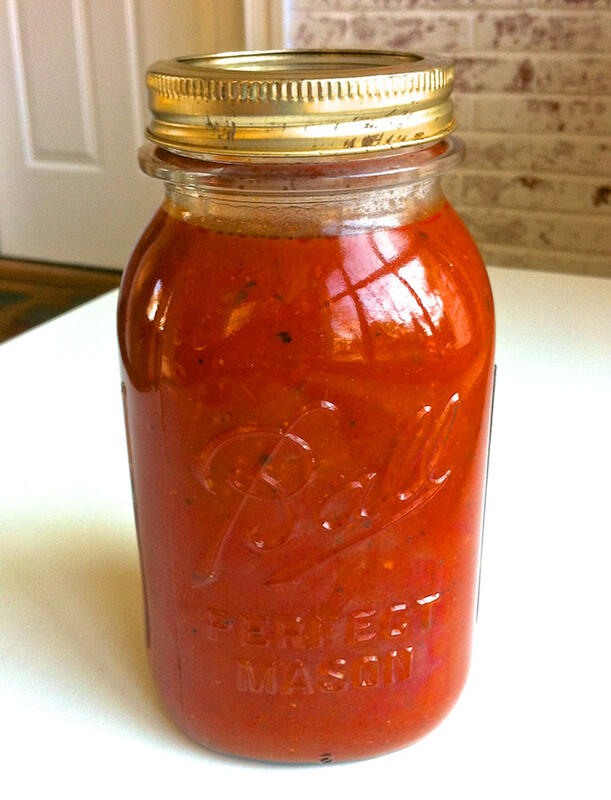 When canned tomatoes are the best option, Basic Marinara (below) is a great option. Tip #1: Double the batch and freeze half to serve later as mini meatloaves. Or reheat with sauce, top with cheese and make into a mean meatball sandwich. Tip #2: If you have a leftover piece of rind from the Parmesan, let it simmer in the crock pot with the marinara sauce or save for another soup recipe. This will add a great flavor boost to most any sauce or soup. For a gluten-free option, crushed Rice Chex work beautifully. When making a big batch, I recommend mixing all of the ingredients except the beef first. This will ensure everything is well incorporated but help prevent over-working the meat. A, these meatballs are seriously,….THE BOMB. so deliciously good! Thank you, thank you. So easy to make and I doubled the recipe thankfully bc they ROCK! I’ve been using this recipe for over 30 yrs..A friend of mine told me to bake them in the oven to reduce cooking mess & clean-up …such a great idea!!! You are welcome, Armando. Glad you liked them! So I tried this last night and they were DELICIOUS but then when I took them out of the oven, after following the recipe, my meatballs came out as half meatballs. The bottoms had flattened out and stuck to the baking sheet. How can I fix this? That is really interesting, Nina, and I am trying to figure out why that may have happened. Do you know the fat content of the ground beef you used? Perhaps the fat content was high and much of it cooked out, causing the meatballs to seemingly shrink. I typically use beef that is anywhere between 85 and 90% lean. I hope this is helpful! After making the balls, I would put in the refrigerator and bake at 375 for 22-25 min. I had the same problem. The solution: Bake on parchment paper! No sticking at all. Did you make sure the oven was completely preheated before putting them in? Or maybe your oven temp is lower than it registers. Warm burger kind of sinks and flattens like that. I found out the hard way that my oven was registering that it had reached full temp before it had. Maybe try preheating 5 minutes longer before putting them in. We did that for years rather than expensive oven repairs. Had an oven like that..buy an oven thermometer to set inside the window this is an inexpensive solution! Too funny, Sheila…and no worries! I’m just glad you made, enjoyed, and eventually checked in! I bet they will be divine with your favorite sauce. You should put them on a sheet pan with a rack or one of those silicone mats. Mine flattened a little on the bottom but Since they were on a rack they were fine. Thanks for the idea, Alison! I am an American of Italian decent. I have never heard of putting oregano in a meatball. Maybe I will try this in a half recipe, just to make sure we like it with the oregano. Yes, you can do a taste test and see which way you like best! Oregano can be pungent, but this small amount does not overpower. Hope you enjoy! Anyone know the best way to store parmesan cheese? Also can you freeze it? I store Parmesan in the refrigerator where it will keep for over a month if wrapped well, Allisan. It is fine to freeze it, too. The meatballs are great. Thank you. 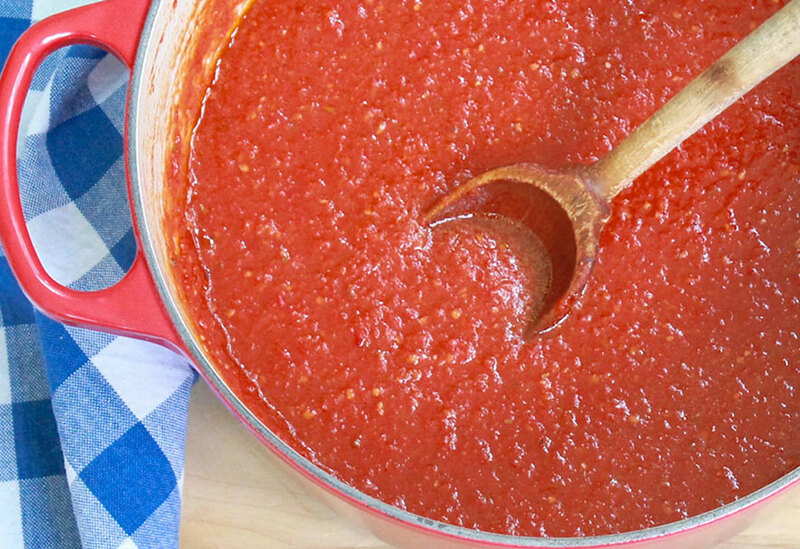 Do you have a good marinara sauce recipe you can share? Can’t seem to get mine just right. Mmmmeatballs! We brought these to the beach at the lake last night – the adults and kids ate them as hors d’oeuvres dipped in the basic marinara. My baby ate FIVE! Delicious! That is so great, Shannon, and what a wonderful setting to have dinner. I bet it was perfect, and I am thrilled the meatballs and marinara were a hit! This might sound crazy to a few, but as I haven’t made meatballs in years, just want to confirm that it is 1/4 cup or parsley or basil? Also, has anyone done both parsley and basil? Yes, Nancy…1/4 cup of fresh herbs is correct. If you use dry, reduce to 1/3 of that amount or a slightly rounded tablespoon. Also, a mix of both herbs would be delicious. You could even mix in a little thyme, chives, or another favorite if you have them on hand. I put parsley in the meatballs and basil in the sauce. These look great! When I don’t have bread crumbs on hand I sometimes crush croutons and use them in meatballs – they add a little extra flavour. Great suggestion, Katie. Thank you for taking the time to share it! This was such a crowd-pleaser! The 5, 8 and 11 year olds could not get enough. We had not had meatballs since my 8 year old was diagnosed with celiac disease, and they had been a beloved staple in our pre GF life… We used Ann’s GF version with Rice chex and they were such a success I cooked a double batch just to freeze! Thank you! You just made my day, Viki! I am so happy these were a hit and thrilled I was able to help bring back an old favorite in your family! Just as an FYI for the GF people. There is gluten free panko out there. I used it for the recipe. It was perfect. Absolutely, Erin. That works, too, so thanks for the mention. So happy you enjoyed! These are delicious! I didn’t have basil and they are still awesome! My house smells of goodness! I love the smell of these, too! I’m thrilled you enjoyed, Amy, and appreciate the comment! Great question, Natalia. You could omit the Parmesan, although it does provide great flavor and some binding in this recipe. If I were to try to closely replicate the flavor I might–odd as it sounds–try ground cashews. Cashews are often used in vegan recipes to mimic the flavor of cheese. If you try, I’d love to hear what you think! Tried these with a mixture of Byson and Grass fed, also used apple sauce in place of cheese, they are amazing. Double batch, half with marinara and the other with grilled veggies topped with Parmesan….Thanks so much for sharing. Thanks for your great feedback, Samantha. I’m so glad you enjoyed! Hey Natalia i am dairy intolerant too remember dry cheese almost no lactose in it look it up. Or i use romano cheese no lactose. I always use fairlife milk lactose free too half the sugar and not thick like lactaid. I’ve failed at making meatballs twice. This is a homerun. This a great simple recipe. I used ground pork and ground beef. I didn’t have fresh basil so I added a teaspoon or so. Next time i shall use fresh basil. This has a great texture and taste. My whole family approves. Thanks for the great feedback, Amy. I am so glad these were a hit with your family! Another thing I did that helped the balls stay round and not flatten is chilled them in the fridge for 10 minutes or so. I made one batch regular size meatballs. And another batch of big meatballs for sub sandwiches. I used a ice cream scoop and that makes the perfect size for subs IMHO. And the cooking time was the same. A convection oven makes the meatballs brown evenly and get a little crust on them. Love these in a meatball sandwich. Thanks for mentioning! I was an Italian girl who could not make a meatball…until this recipe! Oooh yummy! I have some ground beef in my freezer, thinking I’ll use to make these. Thanks Ann! My pleasure, Mary Lou. Enjoy!! I Love Meatballs!! Your Recipe is almost like mine. The difference is I do add dried Cilantro, Oregano and Parsley and they are so delicious! I also make a double (huge) batch and freeze. Great to have for many meals in a hurry! I pinned to save as I never measure when cooking and this helps so my kids have it written someplace safe. LOL..
And I Love your Blog! Thanks So Much!! Oh and another Tip.. I omit the salt and add a packet Of Sazon Goya.. it’s a Spanish seasoning just adds a little more flavor with a latin spin on it. YUM!!! Thanks for your great comments and tip, Marta. I’m so glad you enjoy the recipes! I made for our dinner tonight Ann, it’s a big hit! I used a jar of my favorite marinara and served with spaghetti. My husband even commented on how it would make great meatball subs.. so that’s dinner tomorrow night! I’m so glad these went over well, and your husband is on to something with the subs. We love them! Made these tonight with my 14 year old son. We doubled the recipe, so after filling 2 cookie sheet of meatballs we had some leftover and my son turned it into a meatloaf…he LOVED it. This meatball recipe is awesome and a definite keeper. Thanks! Sounds like you have an excellent kitchen helper! Thanks for the great feedback! Just made my first batch. Not only are they absolutely delicious, they were rather easy to make. My family loves them. I plan to make them a little smaller and serve them as an hors d’oeuvre at my next party…….Thanks Ann! You are most welcome, Debbie! I am thrilled they were a hit with your family and appreciate your taking the time to comment! So glad that I found your website! I’m so glad you found me, too, and am thrilled these were a hit with your family. Thanks for the great comment and hope you find lots of other recipes to try! A number of companies like Ian’s and Aleia now make gluten-free panko, so it’s getting increasingly easy to find. I’m looking forward to trying this recipe! For another option, one of my favorite gluten-free substitutions is using crushed Rice Chex for panko. Even people who can eat gluten often like the Chex version better–perfect crispness and the subtle rice flavor blends in beautifully. Whatever you try, I hope you enjoy! I made these last night. First time I have made meatballs in a year since going GF. I didn’t have any rice Chex but had a funky flax cereal that I couldn’t eat as a cereal! These were so great you didn’t even notice the weird smalls balls of cereal in them. Even my gluten loving family choked these down! Already have a batch in the freezer!! HI Christi – The meatballs look deelish and very close to my own. I am publishing a cookbook and would love to use this photo as an illustration. Of course you would be given the appropriate credit for the image and your link would be shown as well. I’m Ann, but no worries! Would love to know more about your cookbook. Feel free to contact me (see the top of the page) with any specific questions. Thanks for the great comment, Elaine. That’s a perfect way to make evenly-sized meatballs. Yours was the first recipe that popped up when I searched ‘oven meatballs’ in Pinterest and I’m so very glad it did. These meatballs are delicious, full of flavor, quick and easy. These are the first oven meatballs I will be making again! Great news, Christine. Thanks so much for letting me know! my BF can not have any garlic or onion does the recipe still work without or can I sub it for something else? If it’s an allergy, I’d say skip them and don’t worry about it, Kate. If it’s just a preference, you could get similar but milder flavor from shallots. Hope you both enjoy! This is seriously the BEST meatball recipe EVER. They are perfect every time I make them. The only substitute I make is onion powder instead of chopped onion. These are the BOMB. My husband told me to stop looking for meatball recipes once I found this one!!! It is the keeper of all keepers! Such a great comment, Sharon. Thanks so much for letting me know. I’m glad they’re a hit! My grandson is allergic to eggs. Is there anything else that I could use? Some people make a flax egg, but I think the neat egg is an outstanding option. I am linking a post for which I tested it, followed by a link to their site. In many areas it is available in grocery stores and specialty markets. I hope this helps! My family loves these meatballs! I can’t buy pre-made meatballs anymore! Instead of bread crumbs can I use white rice? Thank you for this recipe. These are the best meatball as my wife and I have ever eaten. If, like us, you are an onion lover, increasing the amount of onion and not dicing them too small works perfectly. Thank you for the great feedback, Andy. I’m so glad these were a hit! Thank you so much for this recipe. Tonight is probably the 20th time I’ve made these and they turn out perfect every time. These meatballs are the bomb. I have tried so many recipes over the years but these are PERFECT every time. And my husband loves them too!!!!! I thought is said “goofball” sized meatballs! Can’t wait to make! No one will mind a flat side on a meatball that tastes great. : ) Thanks so much for your great comment, Lisa. I’m so glad you like! Freeze cooked, uncooked, or either? You can freeze either way, Emily! My daughter in law is nursing and can’t do dairy. How would I alter this if I left out the cheese? What could I use as a replacement? Would they be ok if I simply left the cheese out and didn’t replace it with any other ingredient? Hi Lisa, You could certainly make this recipe without the cheese, although it does add extra flavor and binding qualities. I have heard of people using ground cashews–I’d use roasted and salted in this case to mimic the hint of saltiness provided by the Parmesan. You could also try nutritional yeast, a vegetarian staple that, when combined with a little salt, matches the flavor of cheese quite well. In both cases I would use the same quantity. In the case of the nutritional yeast, I’d add an additional 1/8 to 1/4 teaspoon kosher salt. I hope that helps. If you try, I’d love to know how you make out…and best wishes to the new mom! Sounds perfect, Debbie. Thanks for mentioning your adjustments! I haven’t tried, but I think it could be good. My suggestion, however, would be to use dark meat as the breast meat is more likely to dry out if overcooked even a little. If you do try, please report back! Made these for a large group of the University of Michigan men’s rowing team last spring and thankfully pinned this recipe on Pinterest — the meatballs were gone in seconds and the guys loved them. Changes: added 1 lb Italian sausage to every 3 lbs of ground beef and substituted crushed french onions instead for the bread crumbs. Seriously awesome meatballs! Off to shop for the ingredients for tonight’s crew dinner! Hi Kelly, It’s great to know these meatballs fueled a bunch of really strong guys…such a demanding sport and fun to watch! Thanks for the awesome feedback and for mentioning your tweaks. They sound perfect and I’m glad they’re on the menu again! Made these today and they came out so good! They were very tasty and moist!! Added them to my spaghetti sauce with sausages, so yummy!! Terrific, Karen! Thanks so much for taking a moment to comment! It does not say whether the pan is lined with foil or sprayed with cooking spray. 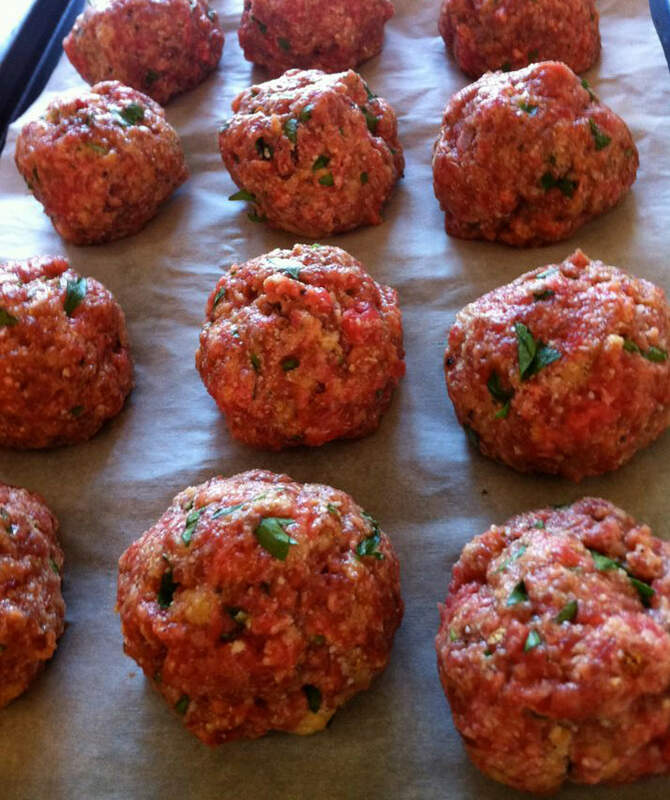 My meatball receipe is very similar and i fried them.I was looking for a way to bake them. In the photo you can see what I like to use–parchment paper. Lightly greasing the baking sheet or lining it with foil (which I would still lightly grease) would work well, too. Do you spray your parchment paper? I don’t spray the parchment, Dana. If I use foil, I do spray lightly. Hope this helps! I am alone and too tired to make lengthy recipes. This looks easy and tasty. I can follow recipe, when done simmer in my marina sauce. It is easy, Bea, and I’m sure they will taste especially delicious after simmering in your sauce! I was desperate for an easy meatball recipe for busy weeknights & I have FINALLY found one I think it’s absolutely perfect! Thanks for posting! Followed recipe exactly & thought there was far too much liquid & far too much breadcrumbs but I was wrong. It’s perfectly yummy! Fabulous! So glad these were an unexpected hit! I have found that frozen hamburger can contain less moisture than fresh. Have you experienced this? I usually start with fresh, but ground beef stored in the freezer could definitely dry out over time, especially if not well wrapped. Maybe you could try double-wrapping when you do freeze it and see if that helps. Can’t wait to try these in my meal rotation this week! I’ve been looking for a good meatball recipe for way too long now lol- have you ever made these with ground turkey meat?? Hope you love them as much as we do, Alyssa! I always make this recipe with ground beef–mostly out of habit. If I were to make it with ground turkey, I’d go for a blend with some of the dark meat to avoid drying out. If using ground turkey breast, just be extra cautious not to overcook. Thanks for letting me know, Pat. Enjoy! Just multiply all of the other ingredients by six, Tee. Can these be made and put in fridge to cook a couple days later? I think they would be fine for a day or two. Generally speaking, when you want to use dry instead of fresh, use 1/3 the amount as the dried herbs are more concentrated. Like you use 1/3 cup if they are dried herbs, instead of 1/4 cup if they are fresh?? Also, what tastes better in this recipe- parsley or basil?? You would want to use 1/3 of the total amount–so less–when using dried instead of fresh. So 1/4 cup fresh would translate to 1 tablespoon plus 1 teaspoon dried. As for parsley or basil, I tend to use what I have on hand. I like them both. You could even use a mix! These meatballs are phenomenal!! I made them gluten free with Schars gf breadcrumbs for my husbands recently diagnosed celiac disease. I will never look for another meatball recipe!!! May try with ground turkey next time. So so good!!! Such great feedback, Peggy! I’m thrilled these were a hit! Thanks for this recipe, it’s so delicious and easy. I love the tip you gave of putting the Parm/Reg rind in the marinara while simmering, it tastes awesome, never would have thought of that. For the last 5 min I move my meatballs to the simmering sauce with the rind and the flavor is delicious. These meatballs don’t last through dinner in my house. Thanks so much for your thoughtful comment. I’m glad they go fast! Turned out delicious!! Thank you! I’ve been looking for an easy but delicious meatball recipe. I’ve tried so many and this is the best and essentially foolproof. I just made two batches of these and both times were delicious. Not to mention clean up is so easy and there wasn’t any grease flying anywhere. Thank you!!!! Such great feedback, Vanessa. Thank you for taking the time to share it! I make these often and they are easy and delicious! I’m so happy to hear that…thank you! Would you use this recipe for making cocktail meatballs? They are quite versatile, Louise, so I would. They have a wonderful savory flavor that I think would stand up well to a sauce with some sweetness. Love this recipe. So easy for a busy day. I’m glad you think so, too, Carol! I’m always happy to have a batch in my freezer to pull out whenever needed. I used a good jarred sauce but I’ll try your recipe for marinara next time. So glad you have a viable option to the 25-mile drive, Brent! Thanks for letting me know, and have a meatball sandwich for me! I cooked them at 350 on my pellet grill with cherry wood pellets. Oh my, relish! I bet the flavor was extra good! I would like to try this recipe, but I am having someone that is allergic to milk products. Can I use water instead of milk and eliminate the Parmesan cheese? I know it won’t be the same, but…..
As luck would have it, I actually forgot to add the milk last week when making a quadruple batch of these (!!) and they turned out just fine. You could substitute chicken broth to make up for some of the flavor that the Parmesan would contribute. Hope that helps and that the modified version is much enjoyed! WOW! Totally amazing! My extremely picky family absolutely loved this recipe! My 11 yr old daughter ate 8 of these before we even sat down for dinner! Thanks a million for sharing! This will become a definite staple in our house! That’s awesome, Amy. It’s always a victory when you satisfy picky eaters–and I speak from experience! So glad this was a hit! I’m going to make these meatballs for a Christmas get together (potluck for only about 60 people), they call for panko or breadcrumbs & you can substitute Rice Chex. Can you substitute quinoa flakes, & if so how much would you use. Also if using oatmeal how much would you use. The recipe looks amazing . Thank you for sharing. That’s a big group, Shirley! You could probably use quinoa flakes, but to be safe, I would try them first with a regular-size batch. I would hate for you to use them and not like the outcome in what is sure to be a very large batch. Oats can be used. To avoid any noticeable flakes, you may want to pulse them several times in the food processor before adding to the meat. This is mostly for visual appeal. Also, when making a big batch, I recommend mixing all of the ingredients before adding the ground beef. This will ensure everything is well incorporated but help prevent over-working the meat. Hope everyone enjoys! When making a huge batch, small inconsistencies in measuring are amplified. This might have thrown off the amount of binder, for example. Also, when meatballs are in a slow cooker for an extended period of time, they can break down. Were yours in the slow cooker for a while? Either way, it sounds like they tasted great–and you were wonderful to cook for such a large group of people! I don’t think they were in to long about 4-5 hrs on low from frozen. Is that to long? So yummy. And even better because they are so easy to make. Thank you! So true, Susie! Thanks for taking the time to let me know! They were spicy and very garlicky! i’m going to make them again without the garlic. Some garlic cloves are bigger than others, and sometimes there’s a green part inside the clove that can be more potent. Removing that helps, but you can certainly skip the garlic entirely if you’re not a fan. These are awesome. I make them all the time and family loves them. So happy they’re a keeper! Thanks 4 u recipe! I plan on making it w turkey meat tomorrow! Is it necessary to prepare the mixture the day before. What I’m really asking will it taste better if it is placed in frig the night before without making it into the balls, but just to let it sit. & if yes, will it also dry out that way. Thanks 4 this simple yet great ingredient recipe! If it’s more convenient, you can prepare the mixture in advance but it really isn’t necessary. The meatballs will taste great either way. Hope this helps and that you enjoy them! Thanks so much 4 the recipe! I just wrote a comment, not sure you got it. Is it better to make this the day before & keep in the frig without the balls in order to enhance the flavor. & if yes, will it dry out?? Thanks Ann 4 this simple yet great ingredient recipe! Just answered, Amy! I have to approve first-time commenters–it’s typical of a WordPress site. From now on your comments should appear right away. Thanks so much Ann! I just was not sure initially that u received my comment! I plan on making them pm tomorrow! I did ck different ones out, & chose yours! Thanks again for responding!! My pleasure! Let me know how you make out! can I use ground turkey instead of hamburger? Will it change the liquid measurements? Hi Arlene, The measurements won’t change but, if you use turkey breast, take care not to overcook as you’ll be more likely to end up with a dry meatball. Hi Ann! Do you happen to have the breakdown of nutritional facts for these amazing meatballs? I made them last night and I am afraid I will be making them alot..lol! Hi Nicky, I just entered the ingredients into the calorie counter that I have linked in the “Helpful Tips” section. Here are the stats…and so happy you like! You’re a doll! Thank you! Thrilled you liked, Carman, and the addition of sausage would be wonderful! I’m so happy these were an all-around hit for you, Amy. Thanks so much for your great comment! I finally found an extremely good and easy meatball recipe. Question, when I made them, they were pull apart soft on the inside but I like a bit more together sponge-ish meatballs, like Larosas from Cincinnati. I have never been able to duplicate their consistency, anybody have any suggestions? I pan seared these for a nice crust and then popped into oven for only 10 mins. For some reason, I have to halve my times in my oven. Should I maybe cook longer for my sponge consistency or is that not it? Glad you liked, Nick, and I wish I had tasted a Larosas meatball to be able to offer a better opinion. The sponge consistency you are referring to may be more a function of fat content and a combination of meats. I think cooking longer would make them firmer. Let me know if this provides any clues…and perhaps someone else has tried your favorite meatballs and can comment! Thanks for responding Ann. Firmer would definitely be a better word for what I am describing and I think Larosas does use multiple meats. With cooking longer, I was just worried about drying them out too much. I think I might experiment a little and try. Thanks! Decided to give these meatballs a try and so glad that I did! My son is a very picky eater and he loved them! I have already added them to my recipe file. Great news, Sharon! Thanks for taking a moment to let me know. I have never used milk or eggs in meatballs. I did use one egg to try.. Won’t the meatballs be saggy if I add milk? Also my lo is lactose intolerant can I just skip it? The breadcrumbs absorb the moisture and help everything bind better. Coincidentally though, the last time I made these I completely forgot to add the milk and they turned out fine. I would recommend using the eggs to help bind everything. Hope that helps! Would like recipe for baked meatballs please. Hi Ann, I made these tonight & they were a hit. I did not have Panko bread crumbs so I substituted Town House crackers that I crushed with a rolling pin. I used my convection oven so they browned very nicely on a foil lined sprayed cookie sheet. Thank you! So good to read your comment, Jeff. Thanks for letting me know. I’m delighted they were a success! I love these. I always have a 50/50 change of finding good recipes online and these are amazing. Thank you so much for sharing. My toddler LOVES them. You are very welcome, Bella. I’m especially glad they’re a hit with your little one! Just came across your meatball recipe so they’re in the oven as we speak. Thanks for letting me know, Teresa. Hope you enjoy! The recipe doesn’t say to cover when cooking or not? This is my first time baking meat balls, I normally fry them. Trying something new. Looking forward to dinner tonight! Thanks. No need to cover the meatballs when baking, Larry. I’m happy you found the recipe and hope you enjoy the new way of cooking them! Thank you for this meatball recipe almost like my Italian mom made! She passed away in August and I didn’t have a recipe for Them.They came out great! I’m so happy this recipe is a close match for one that brings back memories of your mom. I hope you enjoy it often! I like the suggestion of mixing everything but the meat and then add the mix to the meat. Baking has to be better than frying in a skillet and using panko instead of regular bread crumbs makes an excellent meatball. You’re welcome, Arthur. I’m glad the tip helps and hope you enjoy! Great, easy recipe. I made a double batch to share and used one pound of mild Italian sausage along with the one pound of beef. The cheese really is the secret to these meatballs. I can finally stop looking for the perfect recipe. I have found it. They’re so delicious. Thanks so much. I’m thrilled you liked and appreciate your comment, Judy! They were great also tried mixing some pork in them and they turned out great too. Great for swedish meatballs!!! I love Swedish meatballs! Thanks taking a moment to comment, Sandi! I gave your recipe a whirl and the meatballs were amazeballs. Thank you! Fabulous! Thanks for your feedback, Holly! Great meatballs , I added 1/2 pound of sweet sausage and a small onion and fresh garlic cooked in butter ….everyone loved them .. thank you .. Thanks for taking the time to comment, Gretchen. I love your addition of sausage and the onion and garlic cooked in butter. So happy they were a hit! Just made this and OMG! Delish! Thank you for your recipe. Will definitely be bookmarking your site. So happy to read this Pam! Yum! I adore that idea, Christy! My 22 year old son and I made these meatballs tonight – they were AMAZING. Thanks for the great recipe. Yay! So glad you liked them, Susan, and such fun that you cook with your son! Added 1/2 lb of ground veal, also increased the amount of garlic, parmesan and breadcrumbs to offset the additional meat. They baked off beautifully and were absolutely delicious! Sounds like a delicious addition, Stephanie. So glad you liked! My mom and I have been using this recipe for years! I just wrote about it on my blog because our entire family LOVES this recipe and we make it at least a couple times per month! Awesome news, Karina. I’m thrilled they’ve made the regular rotation! 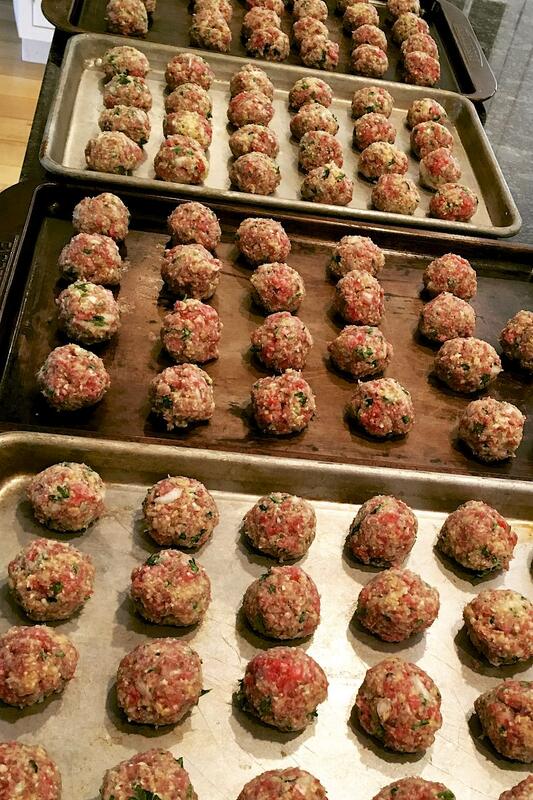 Thank you for sharing your favorite way to prepare meatballs, Lilia. Perhaps someone will try and comment! Thank you.. Awesome easy peasy goodness. These were really good. I had to make some substitutions for what I had but they still turned out great. I used crushed crackers instead of of bread crumbs, Mozzarella cheese instead of parmesan, dried basil instead of fresh, and I added some thyme. It turned out delicious! Your substitutions sound perfect, Misty, and I’m so happy you liked! My very finicky 9 year old decided that we MUST make meatballs for dinner tonight. I googled ” Best Meatball Recipe” and this one came up. I think this one is the winning one in my opinion. Nothing but rave reviews! I’m excited to use the herbs fresh from my garden!! Thank you for sharing such a wonderful recipe! You are so sweet to comment! Thanks so much and I hope you–and your 9-year-old–enjoy every bite! I’m making these tonight for a big crowd (doubled the recipe)! I just mixed it all up and popped it in the fridge because it seemed really wet. I used 1lb ground beef and 1lb ground pork and double all the other ingredients. It is normal for the mixture to be kind of wet? Thanks! I’m wondering if I should add a bit more breadcrumbs? Hi Cassie, The mixture shouldn’t be overly wet. I’m guessing that in the process of doubling, either some of the measurements were slightly off or the wet ingredients simply didn’t get fully incorporated. You may find that the mixture stiffens up and becomes easier to roll after refrigerating. If not, go ahead and sprinkle in a bit more of the breadcrumbs. I’m sure they’ll turn out great in the end! Thanks Ann! They’re about to go in the oven now – and the mixture did firm up nicely in the fridge! So great to read your comment, Erin. I’m thrilled these are a hit with your family! Mixing ingredients before adding the meat is the best thing. I find a better blend of ingredients adds to a better overall taste. Thank you for the suggestion and helping me break tradition. I’m so glad this tip helped, Margaret. I was delighted when it originally occurred to me! So I’ve made these 3 times now. The first time was to see if I liked them. The second time I did a double batch for the freezer. They freeze beautifully! Last time I made a triple batch, and we had one of those freezer packs this evening. Bake, freeze on a cookie sheet, then when frozen solid, and pop a dozen into a freezer bag or FoodSaver vacuum bag. I thaw in the fridge overnight and reheat in either tomato sauce or use brown gravy like I did tonight. Divine! We eat these once every week or two, especially on nights I have to work late. Thank you so much for this recipe. It’s definitely a keeper! Hi Amanda, I’m thrilled these have become a regular dinner at your house and that they make an especially easy meal on busy days. Thanks so much for taking the time to let me know! My family loves these meatballs!!!!!! They are easy to bake and eat just as a main meat dish. Fabulous! We love eating them, as is, for an entree, too, Cathy! I mix mine with equal parts of venison, ground sausage and ground chuck. This makes delicious meatballs baked in the oven, then added to sauce. Guilty of making recipes and not providing reviews. So, will try to improve. These meatballs are excellent. Can’t wait to immerse in fav sauce and cook for 20 minutes or so to add some additional flavor to sauce. I used some seasoned gluten free breadcrumbs and upped the garlic a couple cloves and holy cow. Wow! Terrific recipe. Thanks for sharing!! You are welcome, Barbara. Thank you for taking the time to comment! Such great news, Samantha! So glad this was a hit! My family and I loved these meatballs! The flavours and texture are fantastic. I didn’t have a cup of breadcrumbs so I used some oatmeal and crushed saltines as well, and they were still wonderful. This recipe is a keeper. Thanks so much! I’m so happy to read your comment, Cath! Just made a quadruple batch of these beauties for the holidays. I subbed one lb of lamb for one of the 4 lbs of beef. They turned out amazing! Firm but tender with a delicate browned crust. Very flavorful and moist. First time I’ve used Panko in meatballs. They worked beautifully. When dry, they have a bit of “tooth”, which helps bite through the raw ingredients so you don’t overmix with your hands. I hope they freeze well. I’m going to freeze em up after baking so I have homemade goodies but won’t have to do any cooking while company’s here! Thanks for sharing the recipe! You’re awesome, Michelle! I’m so happy your hard work (4 lbs!!!) was rewarded with stellar results, and I appreciate the feedback. They freeze beautifully, by the way, so you can look forward to effortless meals in the near future! Double batch in our oven now. Homemade sauce from our garden tomatoes ready to welcome these delish meatballs to serve for dinner. Second time making these. Thank you for this recipe. Easy.Delish.Repeat Recipe. You’re making me hungry, Jaci! Delighted it’s a repeater…and I bet that homemade sauce is fabulous! Hi Lia, I use large eggs, so if your eggs are small, it wouldn’t hurt to add one. Conversely, if you use jumbos, you could likely get away with five. Has anyone tried this recipe as an appetizer using the grape jelly and chili sauce? If yes, did it work out ok? Does it have to be the panko breadcrumbs or can I just use the ordinary bread crumbs? You could use regular, Kay. Can I make the meatballs Friday and bake them Sunday without freezing them? Hi Lynn, If you start with really fresh ground beef and wrap them well, they should be just fine. The beef may discolor slightly but that won’t affect the taste. As an option, you can bake the meatballs ahead and then gently reheat…but either way should truly work well. 5 yr old, and 3 yr old)… I doubled the recipe using 1# ground beef and 1# ground pork… Otherwise, everything was TO THE RECIPE. I made them into meatball sliders, with Hawaiian rolls, ooey gooey parmesan/mozzarella blend, and jarred marinara… THEY WERE SUCH A HIT!! Even the kids gobbled ’em up! Of course, my son and I had to sample the meatballs, out of the oven, and pre-slider… They were soooo incredibly flavorful, tender, juicy, and just DELICIOUS!! Everyone raved… THIS recipe is a go-to, favorite, and will be used over and over and over! Thank you for sharing… I’m hooked! Your comment is awesome, DeNece, and I’m so happy these were a total success and will become your go-to. I bet the sliders were incredible…and sampling in advance, of course, is a very important job! So happy your son and the rest of the family approved! Delighted to read this, Sharon! That’s a great way to incorporate the liquid. Thanks for mentioning, Bruce! I just love these meatballs! I’ve made them twice so far and thought this would make a great meatloaf and it did! I made Italian green beans and mashed potatoes. It had such a great flavor i didn’t need gravy or tomato sauce on top of it. Thank you so much! Your idea to make meatloaf was brilliant, Kate! So glad this recipe is a keeper and love the way you’ve adapted it! Can I use Ground turkey or Chicken instead of Ground beef ? I always use ground beef, but you could certainly make that substitution. This sounds wonderful! I love having things in the freezer waiting on me rather than the other way around! I buy ball pint size jars that can be used in the freezer for this type of food. Can’t wait to try all the recipes listed! Meatballs, marinara sauce, baked asiago and pasta and that incredible looking pizza! Will let you know. Just a thought! Maybe thaw a few meatballs quarter them and use instead of sausage! Thank you, Sallie, and I agree. A stocked freezer is a treat, and your meatball/sausage swap sounds perfect! I followed the recipe as is except doubled the recipe and reduced the amount of milk; they taste a little too bread crumby. Not sure where I went wrong unless it was the lesser amount of milk I added. I need help. Hi Amanda, The crumbs soak up the moisture from the milk, so that is likely the reason you notice the breadcrumbs more than you’d like. If you make the recipe again, I recommend trying it will the full amount of milk. Serving the current batch with sauce may help mask the problem. Let me know if you have any more questions! No matter if I turn them halfway, they come out too brown/burnt on bottoms. I use over 85% beef. I spray non stick baking sheet. Any feedback? I’m guessing it might be your baking sheets, Katie. Do they happen to be dark metal? That is often a reason for food burning on the bottom. It’s also possible that your oven’s actual temperature is higher than the set temp. Either way, reducing the oven temperature by 25 degrees should help remedy the problem. Let me know if you have further questions or need more help after trying this! My comments keep disappearing. They were delicious. My husband of 50 years loved them also. I love cooking for him. I’m sorry if you had trouble commenting but glad you persevered. I’m delighted you and your husband enjoyed these–and I’m sure he loves that you cook for him as much as you love doing it. Congratulations on 50 years! Awesome meatballs! A huge Italian family never knew that I switched from Grandma’s meatballs to Jen’s. Ha! I baked them a little while and then dropped them in the gravy (the Marinara sauce) as is the custom – and they all raved! This is fabulous, Nancy! I shared your thoughtful feedback with Jen, too, and she loved it! I made these meatballs tonight with stuffed shells. The meatballs were delicious. Everyone really loved them. This recipe is s keeper. Sounds like a delightful combination, Nancy, and so happy the recipe is a keeper! May I use Italian sausage mixed with the hamburger? I usually make my meatballs with the sausage, but this recipe sounds delish! I also put my meatballs in a mini muffin tin. Works great with my small cookie scoop, too. Making spaghetti next week for family gathering. Definitely trying with the marinara sauce. My house will smell yummy! Hi Karen, I think sausage will add wonderful flavor. Go for it…and your house will definitely smell yummy! Hi, I would like to know if I should freeze with sauce on meatballs? Also, since they are already cooked how long should I let simmer in sauce or should I bake with sauce on them? An Italian Canadian making these ASAP! Hi Lina, I usually freeze the meatballs separately. They can be frozen in sauce and would still taste quite good, but they may become softer than you prefer. For the same reason, I tend to add them to my sauce towards the end of the simmer time. It likely comes down to personal preference, so feel free to try a variety of ways. I hope you enjoy them as much as we do! Thank you so much for sharing these perfect meatballs! Great balance of parmesan, bread crumbs, eggs and the milk! These will be my to go meatball recipe. You are so welcome, Wendy! I’m delighted this will be your go-to recipe and appreciate the thoughtful feedback. Thank YOU for the kind feedback, Sarah. I’m thrilled this will be your permanent recipe! Absolutely the best meatballs that I had ever had ! So easy to prepare. I doubled the recipe . Such great news, Michael. Glad you were all in and doubled the recipe! I will be making these yummy meatballs tonight for a party this coming Sunday. Do bake them and then freeze, or freeze them raw? Thanks for all the tips and tricks and assistance…i truly appreciate this site and all the comments. I usually bake, cool, and then freeze them, Mary, although you could freeze them unbaked. They will taste good either way, I just find it a little easier getting the baking done first. Have a fun party, and thank YOU for your thoughtful comment! Yay! So happy it’s a repeater, Andrea! Haha! Love your comment, Jamie, and glad that Dad earned bonus points! This is my 3rd time making the meatballs and they are perfect every time!! best flavor!! I use my fresh parsley and basil in them and everyone loves them. I bake them on parchment paper and they are always perfect. Thank you for sharing this recipe! I’m so happy the recipe is a keeper, Kathy, and how nice to have the fresh herbs on hand! Can’t wait to try these. Can I substitute almond milk for the regular milk? Thanks! Hi Rachel, Almond milk should work fine. Just make sure it’s not the sweetened kind! My pleasure and so glad! My husband is not a big meatball fan. Says they taste like overdone burgers. He went crazy over these meatballs. He ate so many, I almost didn’t have leftovers. Thank you. Love your comment, Marcy, and I’m so happy these were a hit – especially with your husband! Can the meatballs be baked in the oven on a rack in a baking pan instead of directly on the baking pan? You could try baking them on a rack, Lynda. I haven’t done this, and if you try, I’d make sure to spray the rack to make sure the meatballs don’t stick. I have made this recipe many time now. Everyone loves them especially me. Thank you so much for sharing! You are most welcome, Carol. I’m thrilled you’ve enjoyed these! Wonderful, Jay! In case you didn’t see it, the place to subscribe is partway down the right side of the page. Everyone I make these for is obsessed. The basil is what makes these amazing in my opinion. One of my fav recipes and so easy. Love reading this, Brittany! Thanks for taking the time to comment! This is a wonderful recipe for gluten free meatballs. I never would have thought or imagine that Rice Chex would provide a gluten-free alternative to breadcrumbs. My grandson who has food sensitivities asks for spaghetti with these special meatballs whenever he comes to visit. Thank you! You are very welcome, Cathy. I’m delighted these are now a special request and the adjustments work so well for your grandson. What a wonderful grandmother you are to take requests! So I want to make these, they sound great and the reviews confirm that. Just seems for me like there is too much breadcrumbs and cheese. Like to keep the calories down. Can I cut the egg/milk in half and then cut the breadcrumbs and cheese in half too? Hi Nanci, The recipe really works well as is, but you can absolutely experiment if you like…I just can’t guarantee the meatballs will turn out as well! I don’t tend to count calories, but an upside is that meatballs offer built-in portion control and I find that a few are quite satisfying. Thank you for getting back to me. I will try and let you know! My pleasure. I’m looking forward to reading how your adjustments work out! You could try using flax eggs, and although I haven’t used an egg replacer in this recipe, I’ve had great success with the neat egg. Have you ever tried it? Just wanted to get back to you. I made the meatballs and cut the liquid and dry ingredients in half and they were delicious!! Very moist and flavorful and held their shape perfectly. Will be replacing my current baked meatball recipe. Thank you! Hi Nanci, Wonderful news and thank you for following up with your results. I’m delighted the modifications turned out so well and happy you have a new favorite recipe! Hi this looks great! Am I able to replace parmesan with grated cheddar cheese instead? I think that would be fine…and feel free to report back with an official opinion! Very yummy! My husband gobbled up ½ a dozen before I could even add any sauce. Glad I doubled the recipe & froze half. These will definitely become a staple! That happens here, too! Good thing you made plenty and so happy the recipe is a keeper, Lucy! Great recipe. I have used it multiple times with reproducible success. THANK YOU. I love the minimal clean up! Such good news, Amy. Thanks for the awesome feedback! My Sicilian mom approves! She never measures in her recipe so I tried these to see if they match up, and they do! I use gluten free seasoned breadcrumbs. The cook time is a little tricky I think because of the breadcrumbs, but the authentic flavor is there for sure! Thank you!! I love it! What better than the approval from a Sicilian mother and her daughter?! Thanks for taking the time to comment, Danielle. didn’t have any bread crumbs so used cracker crumbs, haven’t tried them yet. I’m sure the cracker crumbs will work well! I’ve made these quite a few times, reminds me of my Irish Moms meatballs, and I mean that in the best possible way! And thank YOU for the thoughtful comment, John. So happy they remind you of your mom’s! Even thought this recipe calls for baking them in the oven. Can I still fry them? I am making a pasta dish that requires the meatballs to be fried to enhance the flavor of the pasta. You could absolutely fry them, Kelly! THESE WERE AMAZING!! Thank you for sharing this amazing recipe!! If I needed to make them dairy free, what would you suggest to substitute the parmesan cheese? We used an alternative milk and bread crumbs already and it was amazing!! Also, would you suggest freezing these before baking or after baking for future meals? Thank you! Hi Danielle, I’m thrilled these were a success! If you want to omit the cheese the next time, I’d suggest using slightly more breadcrumbs or nutritional yeast plus an extra pinch or two of salt. As far as freezing, you can freeze these before or after baking. My personal preference is to bake and freeze for convenience on a busy night, but choose according to your preference as they will be good either way. I usually don’t do replies, but I must say this is a great recipe. I have made it several times and used my garden herbs. Thanks. I’m so happy you took the time to check in, Anita. Thank you for the feedback and so glad you’ve been enjoying these － especially with those fresh herbs! Just made these per your recipe except used 85% ground beef from the grocery store and Grana Padana parm cheese. I ended up with 16 total. Best tasting, very moist and easy-to-make meatballs I’ve had in a long time. These will be my go-to from now on. Yay, Linda! Thanks so much for taking a moment to report back. I’m delighted this recipe will be your new go-to!